Harding men's and women's coach David Elliott became only the third coach to collect 1,000 wins. The two previous coaches who have reached this milestone are Hampton's Robert Screen and Hawaii's Jim Schwitters. Also this past month Air Force men's Coach Gugat picked up his 700th win and Notre Dame's Jay Louderback registered his 500th victory. 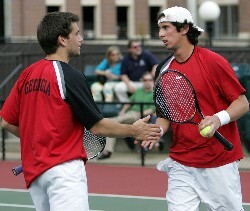 Georgia's Matic Omerzel & Luis Flores defeated teammates -- and defending champions -- John Isner & Antonio Ruiz for the SEC Indoor Doubles Championship. 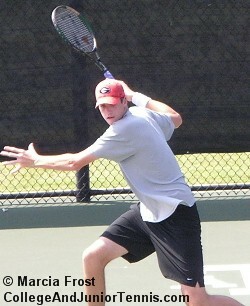 The Georgia team is currently ranked No. 1 and boasting an undefeated season. The University of Colorado has announced the elimination of its men's tennis program along with 12 administrative staff positions in the athletic department. The school cites financial reasons for the cuts, however, it will honor all scholarships for tennis players who choose to remain at the school. Indiana women's coach Lin Loring earned his 300th Big Ten win. Coach Loring has been at the helm of that team for 29 years. The University of Oklahoma men's team and the Clarion University women's team were named the March recipients of the ITA National Team Sportsmanship Award.